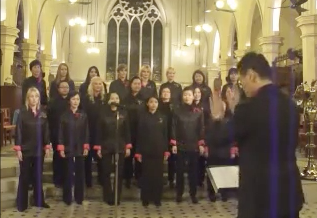 During the 2013 Christmas holiday season, The Hong Kong Women’s Choir held two concerts titled “An Extraordinary Christmas” at the Methodist International Church (December 11) and St. John’s Cathedral (December 18). Grace Notes held an additional a cappella concert titled “Home on that Rock” at Club Lusitano (December 10). The songs performed ranged from traditional pieces such as the Ukraninan folk tune Sleigh Bells and Carols of the Bells to Christmas pop songs, including A Glee-ful Chrismas and Deck the Rooftop (both original GLEE arrangements). The Christmas concerts raised funds for two charities in Hong Kong: the Wing Han Educational Foundation Ltd., an organization helping under-privileged youths improve their educational environment and opportunities; and Sunshine Action, a humanitarian and peace organization feeding the hungry and supporting the poor.